Welcome to the new NTEC website. Check back often as new and informative content will be added frequently! The macula is the central portion of the retina. The retina is the thin tissue that lines the inside of the eye. It contains cells that are sensitive to light and trigger nerve impulses that pass via the optic nerve to the brain which then forms the visual image. The retina is to the eye what film is to a camera. Because the macula is the very central portion of this ‘film,’ any disease that affects it can alter the most important field of the vision. Degeneration is the irreversible deterioration of specific cells or organs caused by injury or disease with resulting functional impairment. Hence, the term ‘Macular Degeneration’ indicates the irreversible deterioration of central retinal cells caused by injury or disease with corresponding loss of the central vision. Because macular degeneration affects only the central portion of the retina, only the central part of the vision is altered. The peripheral vision is not affected. For this reason, macular degeneration usually does not cause total blindness. Unfortunately, it makes reading and driving difficult or impossible. Macular degeneration is most common in the older population. It does not, however, merely result from age. The vast majority of older people do not have macular degeneration. Nevertheless, macular degeneration is the leading cause of decreased vision in the United States. The exact cause for macular degeneration is not currently known. A significant amount of research has yielded only limited results in trying to determine the responsible factor or factors. There does appear to be a genetic link for macular degeneration. Patients who have family members with macular degeneration appear to be at higher risk for developing the disease. Alternatively, many patients with severe macular degeneration have unaffected children. Therefore, genetics is not the only answer. Smoking seems to be implicated in just about everything that can go wrong with the human body. Macular degeneration is no exception. The severity of this disease does appear to be related to smoking. The association between ultraviolet light exposure and macular degeneration is quite strong. The more UV light exposure a person has had during their lifetime, the more severe the resulting disease. Populations with an increased intake of carotenoids have a lower prevalence of macular degeneration. Individuals with a lower cholesterol level have a lower risk of macular degeneration. Postmenopausal women who take oral estrogen have a lower incidence of macular degeneration. There are two primary forms of macular degeneration. These two forms produce different visual symptoms. The first and most common form of the disease is called ‘involutional macular degeneration’ or dry macular degeneration. With this type of degeneration, the patient experiences a decrease in the central vision. This process can result in the inability to read. It can also cause the patient to be unable to see another person’s facial features. While driving, a patient with macular degeneration might have difficulty seeing a car, despite seeing the remainder of the road. The second form of macular degeneration is called ‘exudative macular degeneration’ or wet macular degeneration. With this type of degeneration, an imperfection develops between the retina and the network of blood vessels that supply oxygen and nutrients to it. With such a defect, fluid or blood can leak under the retina, distorting its contour. When fluid leaks under the retina, this produces a distortion of the central vision. When blood leaks under the retina, a scar forms. This process distorts and destroys the eyesight in the center. In addition to the two primary forms, there are numerous other causes for macular degeneration. These include: (1) A juvenile form which is purely hereditary, (2) Physical injury, (3) Infection, and (4) Inflammation. Macular degeneration generally occurs in both eyes. It does not, however, develop at the same pace in the left and right eye. In other words, one eye may be noticeably involved long before the other is affected. In its early stages, macular degeneration is hard to discern. The changes are subtle at first. The patient’s less affected eye frequently compensates, so the patient does not notice the difference in vision. Therefore, a routine eye examination can be quite valuable in early detection. Eye examination: The most effective means of determining the presence of macular degeneration is a routine eye examination. A portion of that examination is devoted to the retina. Detection, by this means, is generally elementary. Once your physician detects macular degeneration, regular assessment of the vision is sometimes appropriate. The severity of the disease determines the need for daily tests. 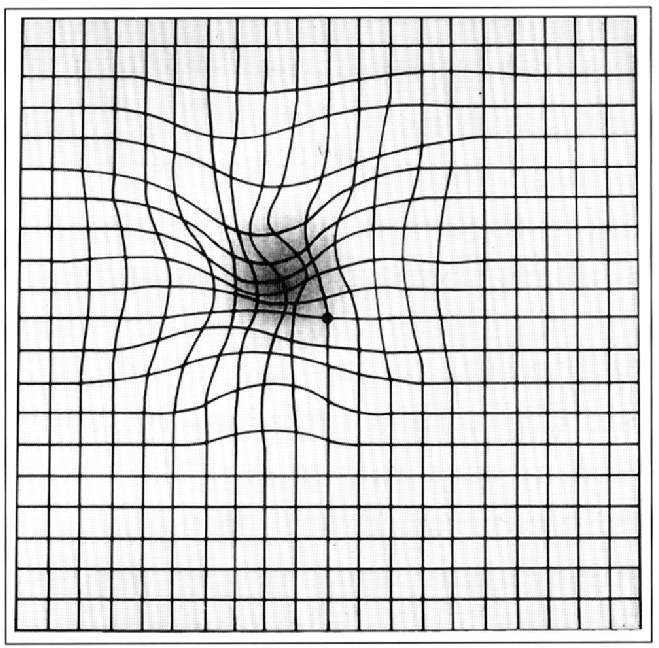 Daily vision tests are conducted by the patient using an Amsler grid. If you develop distortion of the central lines on the grid, progression of the disease may be taking place. Under these circumstances, a patient should pursue an evaluation by a physician immediately. 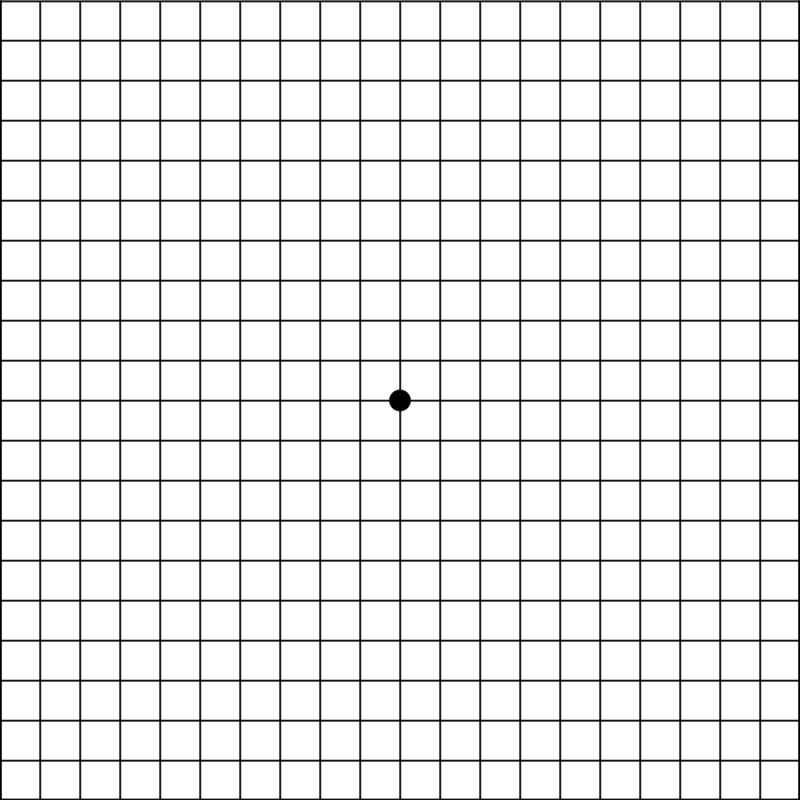 Amsler grid as it might appear to someone with age-related macular degeneration. A fluorescein angiogram may be needed to thoroughly evaluate the status of the retina depending on the severity of the macular degeneration. This test involves injecting a small amount of dye into an arm vein. The dye travels through the bloodstream to the blood vessels of the eye. A device takes pictures of the retina. If abnormal blood vessels are present or leakage occurs, this test will confirm and qualify the abnormality. A major advance in the diagnosis of retinal diseases is the OCT. This particular device produces an image of the retina in cross section and provides a topographical model of the retinal pigment epithelium, internal limiting membrane, and retinal thickness. This advancement in technology has allowed physicians to visualized high definition images of the retina to better evaluate and treat many different retinal disease. If a macular degeneration patient smokes, we recommend that he or she stop immediately and completely. If a macular degeneration patient has untreated high blood pressure or cardiovascular disease, we recommend that he or she seek appropriate consultation and treatment with a cardiologist, internist or family practitioner. All macular degeneration patients should reduce or eliminate their consumption of most fats. In particular, animal fats, vegetable fats, mono-unsaturated fats, and poly-unsaturated fats. Also, all macular degeneration patients should increase their intake of omega-3 fats (those commonly found in fish). All macular degeneration patients are advised to wear sunglasses that are (1) blue blocking, and (2) ultraviolet protective (UV). These sunglasses should be worn at all times when exposed to sunlight. Even if a patient is inside much of the day but has many windows open, protective sunglasses will offer needed protection. Consultation with a certified optician is advisable. Postmenopausal women with macular degeneration may be placed on estrogen if considered appropriate by their general physician. When vision deteriorates significantly, use of low vision aids can be beneficial. Examples are magnifying devices for reading and telescopes for distance vision. All macular degeneration patients should increase their intake of green leafy vegetables, oranges, and yellow fruits. Patients should significantly reduce the consumption of red meat as the incidence of macular degeneration increases significantly with red meat consumption. Researchers have recently found that cholesterol-lowering drugs (such as Lipitor or Zocor) reduce the development of macular degeneration. Please ask your primary care physician if he or she feels that one of these drugs is appropriate for you. Cardiovascular exercise can decrease the incidence of macular degeneration. Consultation with a primary care physician is mandatory before starting or significantly altering any exercise routine. Unfortunately, there is currently not a cure for macular degeneration. Treatment for dry macular degeneration involves taking a combination of supplements called AREDS 2 to help prevent the progression of the disease. When the macular degeneration patient develops the exudative form of this disease (wet or neovascular macular degeneration), the most common and popular treatment at this time involves anti-VEGF therapies such as Avastin, Lucentis, and Eylea. This can be found over-the-counter as Bausch and Lomb PreserVision AREDS2 Eye Vitamin and Mineral Supplement.